Netizens seem to be more keen in identifying the difference between a Toyota Fortuner and a Mitsubishi Montero Sport than the reporters and authorities involved in a news clip about a recent hit-and-run incident in Quezon City. GMA News aired a follow up report on an earlier exclusive scoop regarding a fatal hit-and-run incident last May 3. 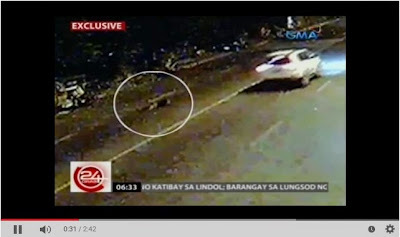 The follow up report which was shown in the primetime newscast 24 Oras last Wednesday, May 20, claimed that the speeding white SUV was caught in several closed-circuit-television (CCTV) cameras in the area and that authorities were able to capture clear images of the culprits who managed to smoke in a nearby place minutes after the incident. Bernardo's statement is in relation to a similar white SUV caught in CCTVs of establishments near the place of the incident. However, upon closer look, the said SUV may look similar to the one involved in the incident but differs in brand and model. Based on their comments, netizens generally disagree to the authorities' conclusion that the 2 SUVs are the same. A Facebook user named Pitz Miranda posted a photo that shows the difference of the two. 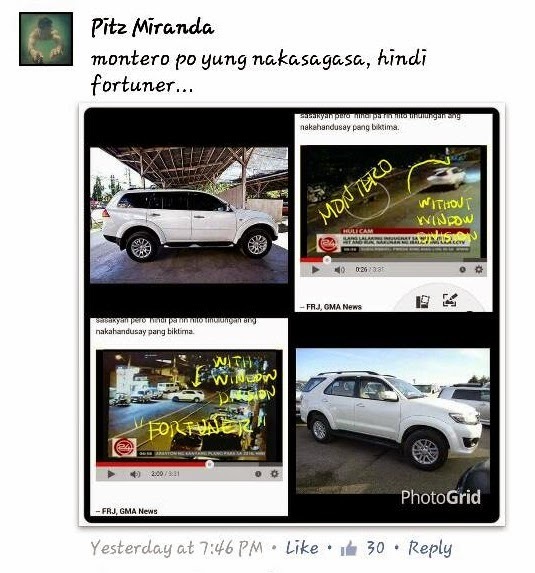 He specifically highlighted 'window division' present in a Fortuner that is not in a Montero. GMA News has yet to reply on the netizens' comments as of this writing. Bong Bohol, the victim who was crossing the street in Brgy. Culiat to buy food, was declared dead on arrival at a nearby hospital.